I needed a break from my Stuart S50 and I wanted to play with my 3D printers. 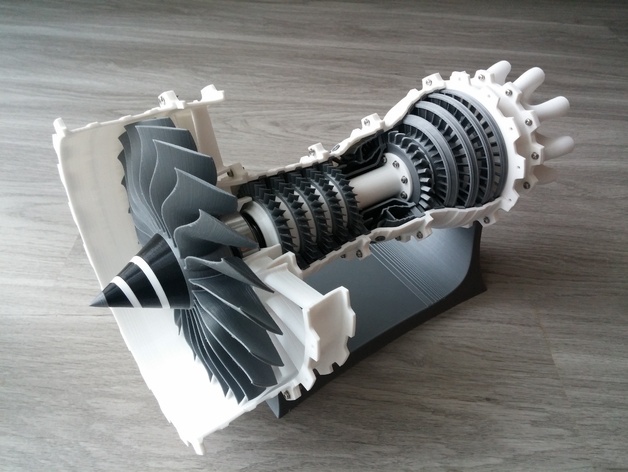 I also wanted to make a plastic model of an engine so I went diving into the poorly indexed font of random stuff that is thingiverse and came up with a model Jet engine to build. Three days and three 3D printers running constantly and we have this. If you are interested in makeup your own, this link will take you to the files. I think it came out well and I learned a lot about getting the most out of my printers. Anyone doing anything interesting (model wise) with their 3D printer? A very impressive engine. Printed in three days??????? How many individual pieces were made to complete the model? Right around 50 parts. Of course I didn’t print them individually. I did multiple batches of multiple parts on three printers simultaneously. I did have to order the bearings but I had the rest of the hardware in stock. Very impressive. I love it!! 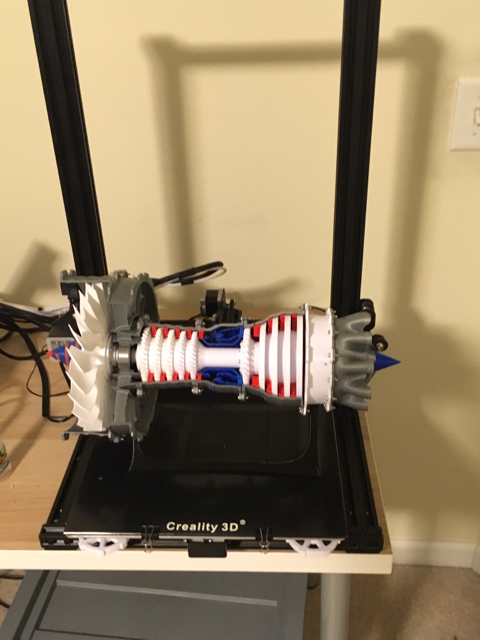 Anyone doing anything interesting (model wise) with their 3D printer? Not much, working on a 1:1 scale sorta replica of a Walther's PPK as a rubber band gun. If I ever get it done, it will be 6 shot, semi-automatic and kind of clip fed - the slide will be the clip. I'm also using the printer to make some parts for my radio control conversion of a Bruder CAT tracked skidsteer, drive sprockets, motor/transmission mount, replacement radiator grill, that sort of thing. Some of the parts don't look printable on my machine. Particularly that round part with the 'tabs' right behind the large fan. What printers did you use? I used a hictop i3 clone and a flashforge creator pro for the smaller stuff and my Creality CR-10 for the stand, fan and casing pieces. If your build plate is big enough you could pull it off. Remember, rafts and supports are your friends. Bad Behavior has blocked 16047 access attempts in the last 7 days.